One of Miyazaki's masterpieces. Incredible animation and music score. I love this movie. Princess Mononoke was the best anime movie I ever saw and i have seen a lot of anime movies. This one beats them all. 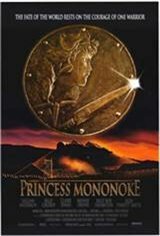 Princess Mononoke was my first real Japanese movie and opened me into the world of Japan. It`s was and still is the best there is. I really enjoyed it. It is the best animated movie I have seen of Miyazaki. Fabulous! Miyazaki has done a wonderful job at creating this beautiful tale of man vs. nature. I highly recommend it for every teenager!